Mamata Banerjee recently alleged BJP govt was trying to drive out ethnic Bengalis, but even those whose names are missing from first draft aren’t worried. Guwahati: The updation of the National Register of Citizens (NRC) in Assam has become contentious not only because it seeks to identify “illegal Bangladeshi immigrants”, but also because it has underlined the schism between the linguistic minority – the Bengalis of Assam – and the ethnic Assamese. West Bengal Chief Minister Mamata Banerjee recently alleged that the BJP government in Assam is “hatching a conspiracy” to drive out Bengalis by “excluding” their names from the first draft. Assam has a history of bitterness between Assamese and Bengali inhabitants of Assam, and Banerjee’s statement is a reflection of these tensions. Her fears, however, don’t find much resonance among the Bengalis in Assam. Several may not have found their names in the first draft of the NRC published on 31 December, but confident that their paperwork is in place, aren’t particularly worried about being excluded. Many ethnic Bengalis migrated to Assam from present-day Bangladesh long before 1971, when it was still apart of Pakistan, while some even moved to Assam during Partition. But officials say it becomes difficult to ascertain who migrated to Assam after 24 March 1971 – the cut-off date for the NRC – which is why the NRC will help. Some, meanwhile, find the NRC updation as a way to establish their Indian, and also Assamese, identity. “We are 100 per cent Indians. But doubts are created about our identity only because we speak Bengali and because of the influx of those from Bangladesh illegally after 1971. The NRC will help clear those doubts forever, once our names appear in the list,” says Anand Choudhury of Jyotikuchi, another area dominated by people of Bengali origin. He adds that if for some reason their names don’t appear, he “will go to court and get justice”. Guwahati: Expressing utter dismay on a responsible politician’s communal remarks over the ongoing process of National Register of Citizens (NRC) updaion in the State, the Patriotic People’s Front Assam (PPFA) urges the politicians in power to exercise restraint while making a public statement. The Assam based forum, while reacting sharply to a recent outburst of West Bengal chief minister Mamata Banerjee claiming that the NRC updating process in the State was a ‘conspiracy to drive away Bengalis’, also appeals to the conscious people of the neighboring State to prevent their talkative chief minister from making such inflammatory statements. The much waited updation of NRC of 1951 is undergoing in Assam following the direction (also monitoring) of the Supreme Court and the first draft of it comprising 1.9 crore applicants out of around 3.25 crore total applicants was released on the midnight of 31 December 2017. The second part of it is expected to be published by early this year. Contrary to the apprehensions by various government and non-government agencies, no unpleasant incident took place in Assam, even though many high-profile individuals are yet to find their names on the list. Rather, everyone accepted the errors sportingly and they are waiting for necessary correction in the final draft. “But shockingly, the Bengal chief minister has tried to communalise the issue with her queer logic. The Trinamool Congress chief has simply tried to play a cunning game as a few Bengali politicians of yesteryear (including ex-CM of Bengal Jyoti Basu) along with a bunch of intellectuals, had done the same during the Assam movement against illegal Bangladeshi migrants,” said the PPFA. In a statement, issued to the media outlets, the forum pointed out that the appeasement policies of Ms Banerjee towards a particular community in West Bengal has seemingly compelled her to make such illogical comments. 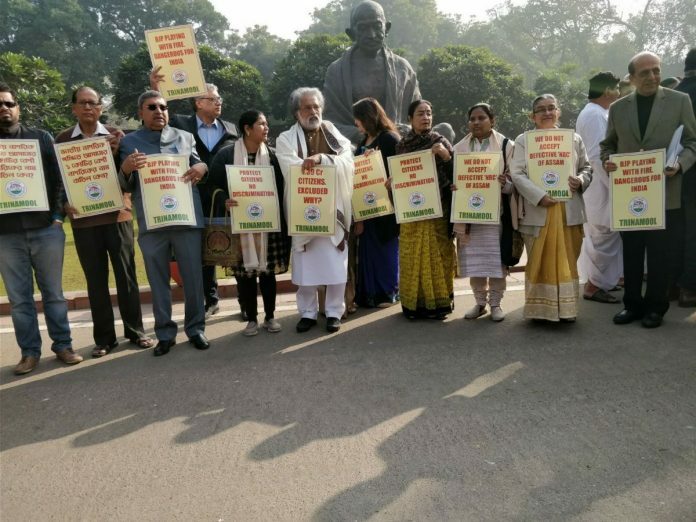 As she has been vehemently opposing the Centre’s citizenship amendment bill one can easily get the idea of Ms Banerjee’s interested group of people, asserted the forum. The PPFA has finally urged the Bengal chief minister to think about the nation first than running behind her silly political interest. The forum additionally appeals to the Bengali speaking people of the region to denounce Ms Banerjee’s comment which may spread misinformation and confusions across the country.